Let’s step away from the table—the focus group table that is—and directly into the shoes of your consumers. That’s right! Go ahead. Try on your consumers’ shoes for size and take a stroll! Put on that empathy hat, too, while you’re at it. You’ll need it as you fully immerse yourself in your consumers’ world! 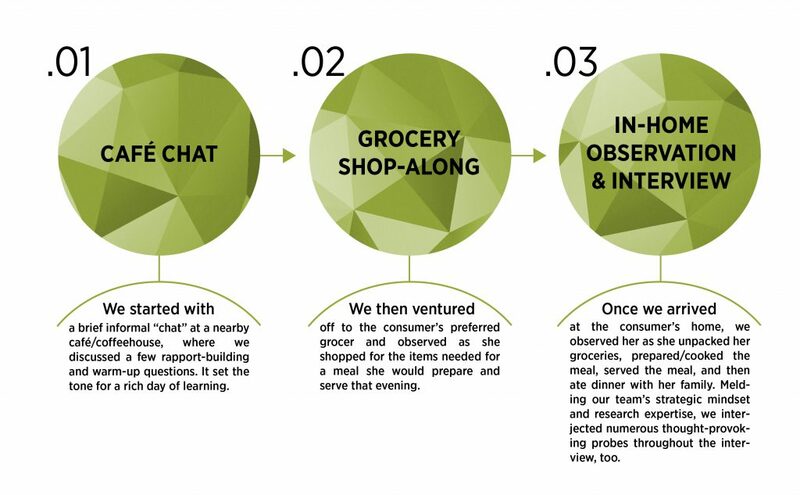 Of all the methodologies available to gain insight into consumers, ethnography research tops the list for me for a myriad of reasons. Ethnography isn’t new to the world of marketing research, we’ve been conducting shop-alongs and in-context interviews for decades. However, ethnographic interviewing continues to evolve, offering even more unique, robust tactics and techniques for diving into the hearts and minds of consumers – on their terms and turf. For example, consumers can be recruited for observation excursions such as “date-alongs” at a nearby café. In addition, consumers are more open to researchers tagging along on their child’s play-date at the local park, or riding shotgun in the car as the consumer runs errands around town. Multi-pronged ethnography studies are also becoming more frequent. In some cases, truly understanding how people live their lives warrants observing them from numerous vantage points. Our Challenge: Illuminate a target segment following a robust quantitative segmentation study. The Target: Women who cook homemade dinners for their families 4+ times per week in addition to other segment-related attitudinal and behavioral qualifiers. Our Methodology: In addition to a kickoff one-on-one briefing call with each respondent as soon as they were recruited, we met with each face-to-face for approximately four hours for the actual observational interview. The Result: We were able to check off the boxes of our need-to-know list, such as how she views her own cooking skill set and the shortcuts she takes shopping and in the kitchen. However, it was the unexpected observations and nuances that truly illuminated these women and brought them to life beyond the meals they prepare, cook and serve their families. How quickly she breezes through the grocery store because she knows her toddler daughter will throw a tantrum if she’s in the cart longer than 20 minutes. The paper plates and plastic cups she typically serves dinner on to save time and effort on clean-up. The herb garden in the windowsill that offered up a few rosemary leaves for the rosemary lemon chicken dish she prepared that night. The array of old, dusty cookbooks and an overflowing beloved recipe box she’s forsaken for cooking and recipe blogs and websites. The overstuffed deep freezer in the garage to store the quick and easy meal options for those days she just doesn’t have time to cook a homemade meal. The family photos and “save the date” magnets on the fridge and the weekly schedule chalkboard hanging on the wall. The children’s toys and sports gear sprawled across the family room. Her choice of décor and the artwork hanging around her home. The eager and very helpful kids and spouses—as well as those who just hid away until it was time for dinner. By the time we finished our last interview, our team was armed with a rich and robust understanding of who our client’s target consumer is, not only in the kitchen, but in all aspects of life. 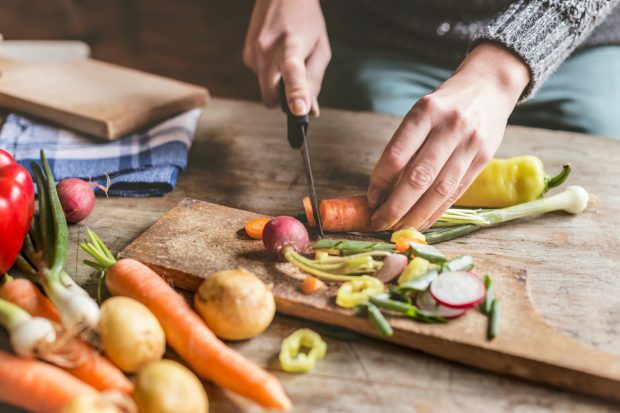 We could feel first-hand the struggle this mom has in balancing the desire to prepare nutritious meals for her family with the reality of her demanding schedule. Other research methods may have led us to some of these insights, but it is difficult to imagine that all of these insights would have come to light in a telephone interview or two-hour focus group. Is ethnographic interviewing the right approach for your upcoming study? Before you start trying to plot out whose dining room table you’d like to sit at, car you’d like to ride along in, or company (or even operating room) you’d like to tour, you need to carefully assess whether ethnography is the right fit for what you aim to accomplish and learn. Although ethnographic interviews can be immensely informative to conduct and observe, the interview can also be more taxing on budgets and schedules than other research methods. In addition, distilling observations, capturing key themes, and finding actionable insights can also be more difficult. Simply put, not every study requires the extent and depth of insights that ethnographic interview studies yield. It’s no doubt that ethnographic interviewing provides an amazingly unique glimpse into consumers’ lives—a deep dive into their hearts and minds—more so than other research methods. Does the shoe fit for an upcoming study you have in mind? If you can make a case for utilizing an ethnographic interviewing study to accomplish your learning objectives, I urge you to go for it! My only caution is to be prepared for some mind-blowing insights! So, what do you think? If you’ve conducted ethnographic interviews, I’m curious to hear your thoughts. Are there other fitting learning objectives you would add to my list? What are some other benefits of ethnographic interviews? Other drawbacks? In what ways have you used ethnography to uncover insights? What are some new and cool ethnographic interviewing techniques you’ve seen or used? To learn more about ethnography research, contact Kendall Nash.